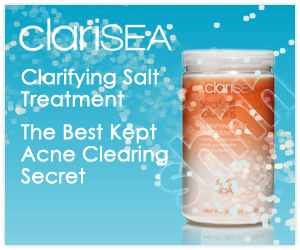 I recently discovered a great natural solution for oily/acne prone skin from Clarisea. 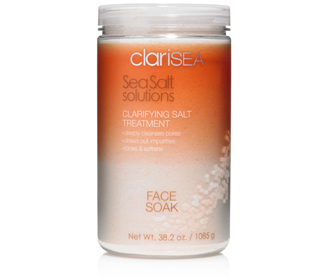 It's called Clarisea Clarifying Salt Treatment and it's an all natural alternative to trying to clear up acne with harsh chemicals that strip and dry skin out. It's made with 100% natural sea salts and minerals from the ocean that work naturally with the pH balance of your skin to return it to its purest state. Allison, the founder of Clarisea suffered from acne since high school but after countless visits to the dermatologist and endless spending on topical treatments, she was completely frustrated and wasn't sure what to do. Then she found hope. The summer after college she was staying at the beach for a month and the ocean water was unusually warm so she was swimming a couple times every day. She started noticing her skin was clearing up from the sea salt. She found that soaking in dissolved sea salt water had the exact same affect on her acne as did soaking in the ocean itself. But the only types of sea salt she could find were too harsh for her sensitive complexion so she set out on a mission to find the perfect skin clarifying salt for both face and body. Five years and dozens of sea salts later, she found the solution to her acne and started a company to help other acne sufferers. Allison sent me this wonderful clarifying treatment and here is my review. Clarisea Clarifying Salt Treatment $18 for 38 oz. Clear your skin with the power of the sea. A specially formulated fine grain blend of Pacific and Himalayan sea salts that naturally combats breakouts without over-drying or irritating skin. While you soak, sodium chloride deeply cleanses and exfoliates clogged pores. Existing blemishes heal more quickly and emerging breakouts are brought to the surface and flushed out. Essential sea minerals including potassium, magnesium and calcium work to tone, soften and smooth out skin while minimizing redness and re-balancing moisture. With regular use this cycle repeats and skin is returned to its most natural state. I was really amazed by this natural acne treatment. My skin felt very clean, soft, smooth and refined after the very first use! With this treatment you can either use a few grains to wash and exfoliate or you can use the face soak method to soak your face in a bowl ($6 add on accessory) in water for a few minutes several times a week. My skin looked much clearer after just a few uses and any blemishes, dried up with no irritation or peeling. I also noticed a big improvement in the appearance of my skintone as well. I highly recommend you try this all natural treatment if you suffer from acne prone / oily skin or if your just looking for an all natural exfoliant that won't irritate your skin. They have an amazing line of products for all skin types. To get yours or learn more, please visit www.clarisea.com.